I want to take a break from the regularly scheduled program here at COMPLETE CONSTRUCTIVE CHANGE to talk about my influences. Today is February 24, 2013. On February 22nd, we observed the birthday of the man who was born in 1928 as Clarence Smith, later came to be known as Clarence 13X, and was referred to by his students as the Father, Allah. On February 26th is the birth date of the man known as Master Fard Muhammad, who taught the Honorable Elijah Muhammad and charged him with building the Nation of Islam. This weekend, culminating in today, the Nation of Islam celebrated its annual Saviours’ Day convention in honor of Master Fard Muhammad. These men are the reason that I’m alive and free to walk the streets today. Their message saved me in the mid-90’s, in my mid-teens, from a lifestyle that was sure to end in prison or an early death. And the soundtrack to the whole story was rap music coming out of the culture that we call Hip Hop. In reflecting on what these men and their message have meant to me, I was inspired to give some explanation of why I think the way that I do. Allow me to speak on a bit of history. In 1963, Clarence 13X departed from the ranks of the Nation of Islam in New York City where he was a member under Minister Malcolm X. He had a mission in his heart to take the lessons of the Nation of Islam, which had been kept secret among initiated members of the group, and to share them freely among the youth of Harlem. The message in those lessons, in a nutshell, was and is that the Black man is God. Clarence 13X came to be known as Allah after he began his mission, with his followers calling him Father Allah. Father Allah met with tremendous success in spreading his message to “the babies”. I won’t go into too much detail about that at this time. In 1965, Malcolm X was assassinated by members of the Nation of Islam in a plot hatched and orchestrated by the Federal Bureau of Investigation (FBI). The man chosen to be his replacement over the Nation of Islam in New York City was Louis X, now known as Louis Farrakhan. These two men, Father Allah and Louis Farrakhan had very, very significant influence on the thinking of the young men and women of New York at that time. In 1968, Father Allah was shot and killed. His followers did not allow his death to be in vain. They spread his message to their contemporaries with renewed fervor. That year 1968 marked a turning point in black history within these United States of America. The FBI’s Counterintelligence Program (CoIntelPro) stepped up its efforts to destroy any black leader and any black organization that had the potential to unite our people around the determined idea of achieving freedom. There were many assassinations all across the country and it really marked the beginning of the end for the strong black leadership of that day. Fast forward to the mid 1970’s. Black communities across the country are experiencing a vacuum of leadership, depleted budgets for our schools, parks, arts programs, and community centers and newly developed housing projects that stacked us on top of each other like sardines. The young people of the Bronx developed a new way to party, a new way to dress, a new way to speak, a new culture, and they called it Hip Hop. Hip Hop was born out of the spirit of desolation and desperation that these communities were feeling. The youth didn’t have training to play musical instruments so they learned how to turn the turntable and their own mouths into instruments and breathed new life into the R&B and disco jams that their parents loved. There was one man who had more of an impact than anyone else on the ideological basis of this new culture. His name is Afrika Bambaataa. He was a former gang leader who was able to steer not just the members of his own gang but rival gangs also into creating a new organization dedicated to peace and fun. That organization is called the Universal Zulu Nation. There are two things about Afrika Bambaataa’s personality that were forever stamped into the fabric of what makes Hip Hop what it is. First is that Bambaataa was heavily influenced by the ideas of Louis Farrakhan, Father Allah, and another Islamic teacher known at the time as Imaam Isa Abdullah, now more commonly known as Malachi York. The lessons studied by members of the Zulu Nation are formatted much like the lessons studied by the Nation of Islam and Nation of Gods and Earths (the current name of the group founded by Father Allah). Bambaataa really filtered those lessons to a much wider audience in a style more palatable to them than the way the Muslims and Gods presented it. 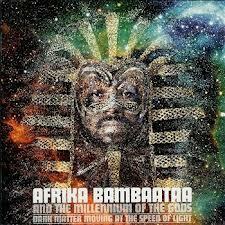 Another legacy from Bambaataa on Hip Hop culture is Bambaataa’s vast musical tastes. He was a DJ, and one of the best of his era. And he was willing to play songs from any genre in the world and find a way to make his young listeners like it. His broad taste influences Hip Hoppers to this day to be willing to experiment with influences from all over the world in the areas of fashion, music, politics, and all other walks of life. Hip Hop’s “golden era” is generally considered to span from 1988 until 1994. That era in the music’s history was marked by a transition from songs primarily about partying and lighthearted boasting into a more serious time heavily influenced by the ideas of the Nation of Islam and the Nation of Gods and Earths. It was as if the seeds planted by Islam in the New York of the late 60s sprouted and bore fruit among the New York raised rappers twenty years later in the late 80s. Acts like Public Enemy, Boogie Down Productions, X-Clan, Poor Righteous Teachers, Ice Cube, Big Daddy Kane, and many many others brought the revolutionary spirit of the 60s into a new era with driving bass lines and catchy melodies and exported that spirit to the whole world. This is the era that produced me.